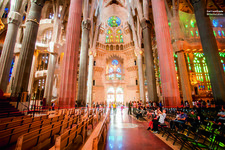 Visit Sagrada Familia church in Barcelona! There are many landmarks that make Barcelona one of the most visited and loved cities in the world. 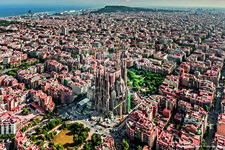 One of them is Antoni Gaudí's Sagrada Familia, the most visited monument of the city and also the most legendary: its construction has lasted more than 130 years and it's still going - the date of its completions is estimated to be in the year 2026, but it's been postponed before. When the very first stone was placed in year 1882, no one imagined its construction would take almost a century and a half! There are many who think its unfinished status is part of its charm, and there are millions who come every year to admire its uniqueness: it counts with more than 3 million visitors a year, and it is the second most visited church of Europe, only after Saint Peter's Basilica in the Vatican City. It was proposed to be one of the new seven wonders in the world, it is -of course!- one of the Seven Wonders of Catalonia and one of the 12 Treasures of Spain. It is one of the UNESCO World Heritage Site as well. It may not come as a surprise that a monument the construction of which has lasted over a century has a tumultuous history. The Sagrada Familia of Barcelona is still incomplete for many reasons - one is, of course, the level of complexity of its beautiful design. Another can be found in its history. We all know that the Sagrada Familia was designed by the acclaimed architect Antoni Gaudí, author of other wonders of Barcelona, such as La Pedrera, the Casa Batlló or the Park Güell. 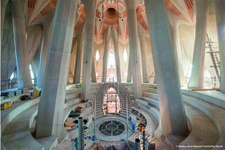 But did you know that the Sagrada Familia has been designed by other 9 architects as well? Gaudí met his untimely death at the age of 73, when he was run over by a tramway. He was wearing old clothes and had an unkempt appearance, and people assumed he was a homeless man - so he didn't get help right away. And this was how partly because of unfairness, the most unique church in the world lost its maker, before the design was even finished. After his death, other architects took on the demanding job of designing and building the most important landmark of the city of Barcelona - and, in fact, Gaudí wasn't the first one either. The project of building was given to the diocesan architect Francisco de Paula del Villar y Lozano, who had a very different project in mind. He would later quit due to disagreements with the city council. When the very first stone of the Sagrada Familia was placed by him in 1882, Gaudí was there in the ceremony - but he couldn't even imagine that project would end up in his hands, and that it would become is masterpiece, and his life's work. He was only 31 when he started working on it! Gaudí knew well his work, and knew that he wouldn't see his masterpiece finished. He made three models with the hope that they would be used by the next generations to finish the church, but part of them were destroyed during the Spanish Civil War. Antireligious groups set fire to the crypt, one of the few parts of the Sagrada Familia that Antoni Gaudí could see built, and many of its sketches and mock-ups were forever destroyed. The Spanish Civil War didn't stop the construction of the Sagrada Familia, but it did slow it. The next architects tried to respect Gaudí's original idea, although if they actually did has been a matter of controversy among the experts in the matter. The controversy reached its peak with the construction of the Passion Façade. Sculptor Josep Maria Subirachs followed the drawings and the instructions left by Gaudí, but he imprinted his personal style on it as well. His work on the Sagrada Familia was deeply questioned, and there even was a demonstration in 1990 against it, where many Catalan intellectuals of the time participated. This is just a tiny part of the steep history of the Sagrada Familia. Along its history it has suffered cuts, changes and controversies - and who knows if there will be more before its construction is concluded! Antoni Gaudí's Sagrada Familia is an Expiatory Church that belongs to an architectural style very unique of Catalonia, and especially of Barcelona, Catalan Modernisme, which is sometimes defined as a mixture between Gothic style and Art Nouveau. Modernisme is, in fact, a very special style based on the shapes and figures of nature, inspired in light and colour, and geometry. 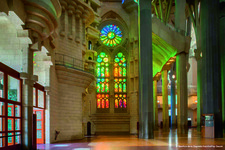 All that can be seen in the impressive Sagrada Familia, as well as many other inspirations. Gaudí conceived his idea from the tradition of byzantine and Gothic cathedrals, and focused on expressing a religious message with architecture. Nothing in the Sagrada Familia is casual - everything is symbolic and responds to Gaudís aim of achieving a symbiosis between shape and Christian symbolism. 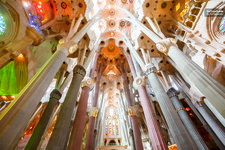 The Sagrada Familia of Barcelona is as ambitious as beautiful! Gaudí didn't forget his roots in Catalan Modernisme. This expressive architectural style finds great resources in light and colour, and Gaudí based his design in the way the rays of sun would illuminate it, and how that would affect its shape. For instance, the morning sun illuminates the Nativity Façade, as a symbol of the greatness of the birth of Christ. Life was the other great inspiration of Gaudí, as can be seen in the different clusters of fruits and natural elements that are at the peak of the towers, and in the colours of the impressive and unique windows, where he used his characteristic technique of trencadís. The ambition of the project can also be seen in its structure. The Sagrada Familia will have a church with five naves, a central one and four in the sides - and the ensemble is shaped as a Latin cross. It has three monumental façades, and will have a total of 18 great towers. Besides, the Sagrada Familia has a marvellous level of detail. In the Passion Façade, you will find the magic square, a sudoku-like square of 4x4 metres. All its lines add 33, the age of Jesus Christ in the moment of his death. But this is only an example: the amount of details and symbols is countless: The Sagrada Familia was Gaudí's masterpiece, and undoubtedly the most ambitious and important project of all the architects that came after him. After learning so much about this unique cathedral, you must be impatient to get to know it! 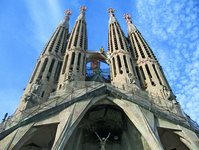 To do so, you will need to get Sagrada Familia online tickets, since it's better to do a reservation before going. 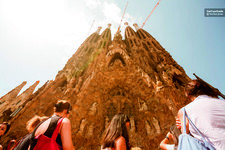 The Modernist cathedral receives around 8.000 visitors a day, which is why it is always better to book your Sagrada Familia online tickets in advance. You can do so with GowithOh! In order to plan your visit, there is some practical information you should know. The basilica has different schedules depending on the time of the year - it closes earlier in the winter (at 6pm from November to February), and later in the summer (at 8 pm from April to September), but it always opens at 9. 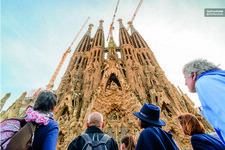 If you don't get your Sagrada Familia online tickets in advance, you will have to endure long queues and get up at the crack of dAwn if you don't want to be queuing the whole morning. So we'll agree that making your reservations before is a real must! 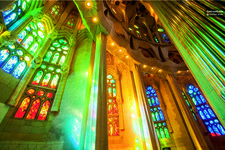 There are different Sagrada Familia online tickets combinations that you can buy, at different prices. First of all, we have the basic ticket, which is 15 euros and is valid only to access the interior of the basilica, but doesn't include a guided visit, access to the towers or an audio guide. If you want the audio guide, the ticket increases up to 22 euros, but that isn't your only option. You can also opt for a visit with a tour guide that will explain tons of interesting things about the basilica for 24 euros. 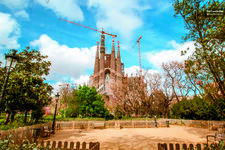 Finally, if you want to climb up to the beautiful towers, you can opt for a combined ticket that also includes a visit to the basilica and an audio guide for 29 euros. 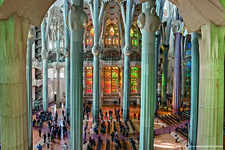 The Sagrada Familia online tickets offer discounts for kids, students, retirees, disabled and people younger than 30, as well as combined tickets for groups. As you can see, the Sagrada Familia online tickets aren't cheap, but the visit is well worth it - as we've mentioned before, the architectural style of this cathedral can't be compared to anything else in the world! 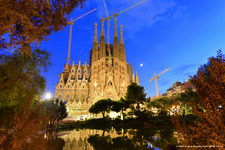 When its construction started, the Sagrada Familia was located in a waste ground in the middle of the city. It would later be built and would become part of the district of L'Eixample, which is another architectural gem studied all over the world due to its characteristic structure: equal octagons that make a perfect grid, perfectly distinguishable from the sky. Before L'Eixample was built, the city of Barcelona was formed only by the neighbourhoods south of it, the ones that are closest to the seaside. All the upper neighbourhoods of Barcelona, such as Gràcia, Horta or Sarrià, were towns with different degrees of independence. The construction of L'Eixample brought their annexation to the city of Barcelona - which explains why 'Eixample' means 'expansion district' in Catalan! The grid-structure of L'Eixample will make it easy for you to orient yourself. Barcelona is in a slope, so you can easily find your way towards the sea or towards the mountain, which means you can also find it between left or right. Besides, it is very well communicated with the metro system: next to the Sagrada Familia, you will find the metro station of the same name, where you can get L2 (purple) and L5 (blue). The purple line will take you directly to the city centre (stations Passeig de Gràcia, Universitat or Sant Antoni), whereas the blue line will communicate you with Diagonal (also city centre) and Sants train station. As you can see, the Sagrada Familia is in a privileged location! In GowithOh, we have a wide offer of apartments for you, in case you want to stay near Sagrada Familia. Choosing one of our apartments near Sagrada Familia is an excellent option, since you will be very close to the city centre but in a quieter and more family-friendly neighbourhood, far from the tourist crowds of the Gothic Quarter or the surroundings of Plaça Catalunya. 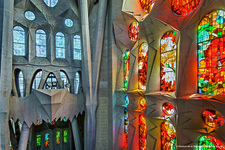 After making the most out of your Sagrada Familia online tickets, you must be willing to explore its surroundings! Fortunately, there are many things to do around the beautiful Modernist cathedral. You can walk up Avinguda Gaudí, a very nice promenade full of restaurants and shops. At the end of it, you will find the old Sant Pau Hospital - the largest Art Nouveau Site in the world! 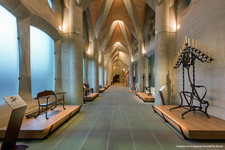 The topic matches your day in the Sagrada Familia, since the architect Lluís Domènech i Montaner is another one of the main exponents of Catalan Modernisme. Sant Pau was built as an enormous hospital and worked as such until a few years ago. Each pavilion was dedicated to a medical specialty, and many of them were connected by underground tunnels. It may not be at the top of your to-do list for your trip to Barcelona, but the old Sant Pau Hospital will surely be one of those unexpected discoveries of your trip. We strongly recommend it! After Sant Pau Hospital, you can take a left and go to Gràcia, a warm and welcoming neighbourhood where you will find charming cafés and beautiful plazas. It's perfect to find a nice place for dinner or a drink, and to enjoy the local atmosphere of Barcelona. Finally, if after visiting the Sagrada Familia you prefer to go towards the sea, you will find the Monumental of Barcelona, a beautiful former bullring of Mudejar style. As you can see, the Sagrada Familia is definitely one of the human-made wonders of the world. 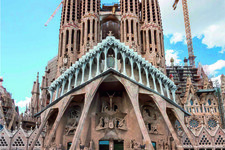 And, in GowithOh, you can now easily get your Sagrada Familia online tickets so you can admire it during your trip to Barcelona!